Fiber Review 2019: Is Fiber a Good Hosting? I signed up to Fiber, reviewed their unique features, tested how easy they are to use, checked with support on several issues, and tested the speed of the live site. When done, I tried to cancel my account and receive a refund. This is my experience with Fiber - I hope you can learn from it. Estonian hosting company Fiber was founded in 2000. They have a stripped back website, and they sell just a few simple hosting services. Their website is available in Estonian and Russian. 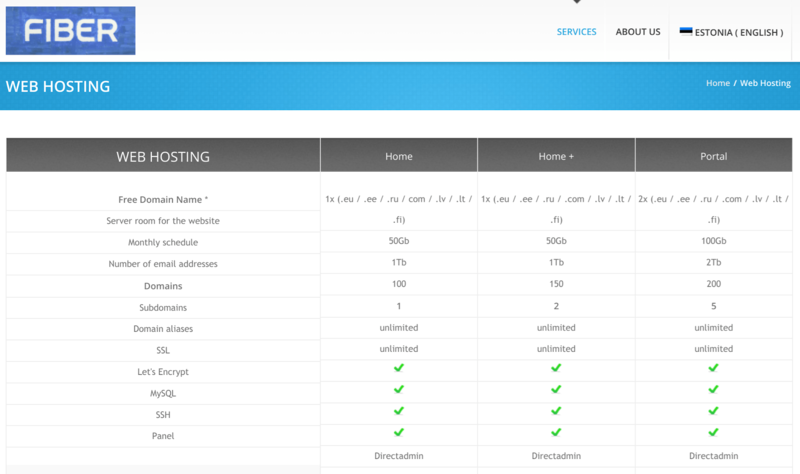 The three shared website hosting packages are called (in English) Home, Home+, and Portal. The two Home plans are similar insofar as they both include 50GB disk space and 1TB traffic, but the Home+ plan includes 150 domains rather than the 100 offered by the regular Home plan. The highest Portal package comes with 100GB traffic and 2TB disk space which makes it a pretty sizable plan. All of the plans come with a free .eu/.ee/.ru/.com/.lv/.lt/.fi domain and a free Let’s Encrypt SSL certificate as well as SSH access. As well as their three shared hosting plans, Fiber also sells server rental and server colocation. Their dedicated server base plan comes with 8 streams, 16GB of memory, 2 x 2TB HDD, and you can contact the company to configure the servers as needed. Unfortunately, Fiber’s website was pretty empty when I visited it. The homepage looked like it was still a work-in-progress and there was no information about data centers or servers. In their favor, although their plans aren’t feature-packed, they do have high resource quotas. Fiber’s resources are really high, with even the lowest package providing 50GB of disk space and 1TB of traffic (which is much more than most everyday users need). Plus, domains and SSL certificates are included free of charge. The downside is that there are very few value-added features apart from SSH access. Taking everything into account, the prices are okay. You can sign up to Fiber’s plans on one, three, six or twelve-month terms, and they are heavily discounted when you purchase a longer plan up front. To get support, you can create a ticket, send an email, or call the company. They don’t advertise their business hours, and there is no knowledge base, but there is a client area that requires you to log in, so who knows what hidden gems lie behind the login page? Fiber is certainly not the best provider for lots of added features. However, if you’re looking for an affordable, no-frills host with simple fuss-free packages and high resource levels, then this provider might work for you. Wondering how Fiber stacks up against other Web Hosting companies? Enter any other Web Hosting company and we will give you a side-by-side comparison.